Which is better Amaysim or Vodafone? If you want a phone under contract, Vodafone might be right for you. Amaysim don’t offer that sort of plan. However, if you want a SIM Only plan, Amaysim beats Vodafone hands down across the board. Amaysim’s pricing is better, they give you more data and their customer service is the best in Australia for a phone company. Perhaps most importantly, their coverage is more reliable than Vodafone’s. Amaysim are better than Vodafone in every way, unless you need a phone under contract. In the article below, we consider the prices, services, and coverage that each of these phone companies offer so you can compare easily. And we offer an alternative to Vodafone which you might not have considered. The alternative is Lebara. They use the Vodafone network. Lebara could just give you everything you need for a fraction of the cost you would otherwise have paid. Amaysim are better than Vodafone in every way, unless you need a phone under a contract. For SIM Only shoppers, the best plans to get are Amaysim’s. Before we write them off, however, let’s give Vodafone a fair go and consider the circumstances in which they might be right for an Australian shopper. Vodafone was originally a UK company. Vodafone launched in Australia back in the 1990s and, in 2009 the Australian branch of the company was bought out and merged with ‘3’ ( if you remember them. ) The resulting company was called VHA and has operated from a North Sydney office ever since. You can’t have failed to notice that Vodafone has some troubles with their network service and coverage. At one point, it got so bad that the CEO had to publicly apologize. Fortunately for Vodafone’s customers, and people considering signing up to them, these issues have driven down their prices. Importantly the issues are now largely fixed. Don’t write them off entirely. Vodafone are one of Australia’s largest phone companies. They are emulating here work they’ve done overseas. Their goal is to avoid head on price competition with Optus and Telstra. As a result, they’re including value added services in their plans which you won’t get with Amaysim. For now, the range is limited to free Spotify ( a music streaming service ) on some of their plans. More ‘value add’ content is coming down the line with the recent announcement of a video streaming service – Stan. Actually, Vodafone were the first Australian phone company to announce the inclusion of an SVOD – Streaming Video On Demand service within their plans. Since then Optus have signed and launched Netflix. Telstra have released their own ‘Presto’ product which does much the same thing. Vodafone have yet to release Stan ! As we say, Vodafone’s network coverage has improved a lot. However, given their problems, and troubled perception, Vodafone have responded rationally. For a while now, they’ve offered a network guarantee. Vodafone’s network guarantee states that if you sign one of their contracts but end up with inadequate network service, you can return the phone you’ve taken and cancel your contract at no cost. You will have to pay for what you use of course – any phone calls and SMSs you sent which you had the phone.Amaysim don’t offer the Vodafone network guarantee or their own equivalent of it, as a benefit. But that’s no real disadvantage. Amaysim only offer month to month agreements and SIM Only plans. The Vodafone Network Guarantee only kicks in under a contract. If you take a SIM only deal from either Vodafone or Amaysim, you won’t have a contractual commitment and you’ll be able to leave at any time anyway, if you don’t like the experience of the network you’re getting. Vodafone are better for 24 month contracts. Amaysim just don’t offer them. It’s important to be clear. Vodafone do also offer SIM Only plans ( which is all Amaysim have. ) However, Vodafone also have the option of a 24 month contract. While those 24 month contracts are not right for everyone, they do provide a ‘free’ phone. In reality, the cost of the phone is included in the plan. However, since Vodafone offer this opportunity and Amaysim don’t, it’s one of the major differences between them. We’ve covered it in detail, below. You can compare Vodafone’s plans to the competition here. The difference between a contract and a month to month agreement is the major difference between Vodafone and Amaysim. The contract / month to month discussion is such a substantial one, we’ve broken it out here in to it’s own section. Vodafone offer you a 24 month contract and include the price of the phone in the plan you sign up to. When you take an annual contract, the cost for a new mobile phone can be split into monthly payments. This allows you to only pay only a small proportion the cost of the new phone every month. Contracts allow people to get a nifty, high end phone where previously, with no contracts, they wouldn’t be able to get one. It helps people who couldn’t have taken the hit of a single bill covering multiple hundreds of pounds to split the cost over 2 years. The ultimate benefit of not having a contract is flexibility. You can cancel the service if you are unhappy with Amaysim without incurring fees. You can finish the month that you’re in and move on to another provider. That applies whether you simply don’t like the service you’re getting, the coverage you need or you see a better deal in market. Amaysim only do month to month SIM Only agreements. Since Amaysim has no contracts, you will need to have to stump up the money for a new phone in the first place. That’s not a problem if you already have an unlocked mobile you are using. It could be a major problem if you can’t afford to shell out the $1000 that a top of the range smartphone costs these days. Amaysim use the full Optus 4G network. They don’t use a part of it, they don’t use some of it, Amaysim use the full Optus 4G network. Amaysim are Australia’s 4th or 5th biggest phone company. It’s hard to tell because they’re growing so fast. They have a simple business model which has proved successful overseas. Vodafone’s cheapest unlimited plan is $50 and it comes with only 3GB of data : Simply put, Amaysim offer better value. If you compare the lowest priced unlimited plan from Vodafone, you’ll find it’s $50. With that, you’ll get just 3GB of data. Until March 2015, one of the key factors working in Vodafone’s favor was that Amaysim only offered 3G services. Now that’s all changed. Amaysim use the full Optus 4G network. They don’t use a part of it, they don’t use some of it, Amaysim use the full Optus 4G network. Amaysim’s plans don’t come with additional content bolt ons or free tickets to see The Wiggles. Additional services like content value adds including Spotify just add to the noise and confusion and ultimately, get included in the prices which are charged to customers like you. postpaid plans, the inclusions are different and prepaid is usually less. Amaysim have the best customer service in the industry. 96% of their customers would recommend them to the alternatives. They regularly win the industry’s top awards for customer service and satisfaction. This is definitely something that Vodafone can’t share. You can compare Amaysim’s plans to the competition here. Getting the best of both worlds : Who else uses the Vodafone network ? Amaysim is a smaller phone company or ‘MVNO’. Smaller phone companies offer deals which are hard to pass up. But it’s not just Amaysim who do it. There are MVNOs who operate on the Vodafone network. The one we recommend is Lebara. 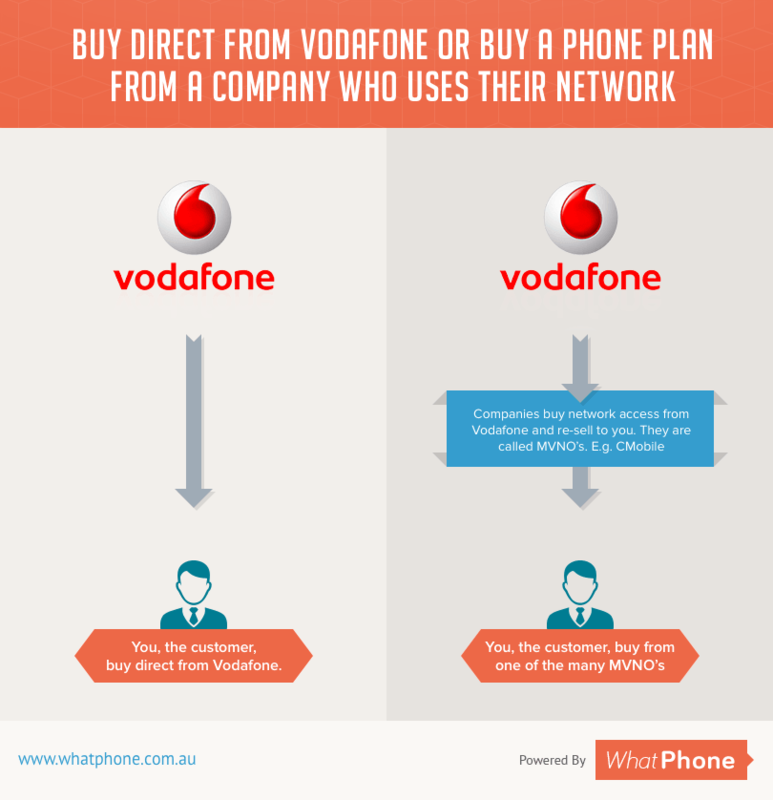 If you’ve decided you want to get the best deal on the Vodafone network, consider an MVNO. MVNOs mean you won’t have to experience the customer service problems that some of their customers complain about. Additionally, you’ll get some extremely keen pricing which undercuts Vodafone’s. And remember, these guys are on exactly the same network. Lebara offer an unlimited plan for $29.90 which is very similar to Amaysim’s but which is $10 a month cheaper. The difference, of course, is the network they operate on. Whatever happens here, you’re going to go alright choosing from these options. For coverage which beats Vodafone, customer service which sets the industry standard and pricing which beats Big Red hands down. Amaysim didn’t get to be one of Australia’s biggest phone companies by accident. They’ve nailed their customer offering and many of the customers they’ve picked up have been from Vodafone. If you want access to the Vodafone network and have a slightly older ( 3G ) phone ( around half of Australians do at the moment ) then consider Lebara. Lebara are an MVNO who offer fantastic value and a full $20 discount on the cheapest Vodafone Unlimited price plan. If you want a new phone and you can’t afford to buy one. Neither Lebara or Amaysim offer contract with phones included. It could be that Vodafone are your route to getting your hands on a phone you wouldn’t otherwise have been able to afford.